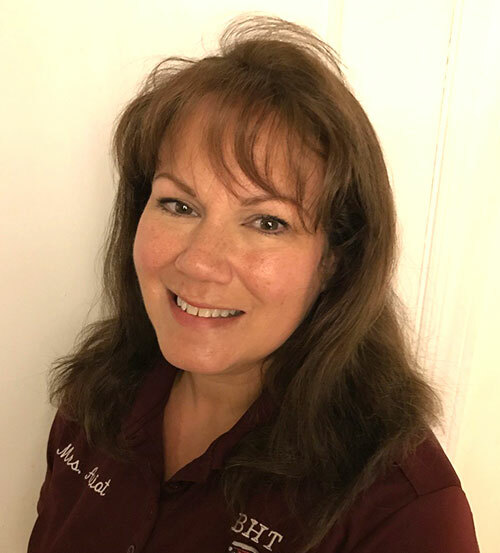 Roxanne Amiot has been a high school Auto Technology instructor in Connecticut for 28 years, and is the head of her department at Bullard-Havens High School in Bridgeport. A graduate of this same program, she returned after working in the field to empower students with the skills to build a successful career in the auto industry. She is an Automotive Service Excellence (ASE) Master Certified Technician with L1 and G1 certifications as well. Her automotive technology is accredited by the National Automotive Technicians Education Foundation (NATEF) and Automotive Youth Educational Systems, and she has assisted 8 of the 17 high school automotive programs in Connecticut in receiving NATEF accreditation as well. Ninth grade students at Bullard-Havens explore a variety of trades in their first months at school, and after two phases of exploration, select a trade specialization for the remainder of high school, along with math, science, and other traditional academic subjects. Students in the Automotive Technology program follow a Connecticut state curriculum based on competencies and standards of ASE and NATEF. Each student has an Automotive Student Success Plan which tracks progression through high school to employment or post-secondary education. Seniors must complete their portfolio for use in employment and perform a capstone automotive project. Students who successfully complete this program graduate with a number of industry certifications and college credit at local community colleges, whose programs seamlessly articulate with Amiot’s. Connecting students to industry is a key aspect of Amiot’s program, and students participate in an in-depth career exploration/job shadowing process to discover where and in what position in the industry they would like to work. Students will work on interviewing skills and make a resume and cover letter before visiting an employer — not just to develop these important skills, but also to help them become committed to the process through research and investment of their time. Amiot takes students on exploratory trips to community college auto programs, local dealerships, and businesses, and energizes student interest through visits to the auto shows in New York City and Hartford. Amiot brings former students who are now working in local industry back into her classroom to mentor and inspire those in her program, and she uses her own story to demonstrate that work in the trades can be a path to a fulfilling, sustaining career. Amiot has received Teacher of the Year awards in 1995, 2005, and 2013, and was fourth runner-up for the AYES Instructor of the Year award in 2002. She also received the Bridgeport Rotary Club’s “Service Above Self” award for her work in her school and larger community in 2015.